Artur de Sousa, better known as Pinga, was born on the Island of Madeira on 30 July, 1909. 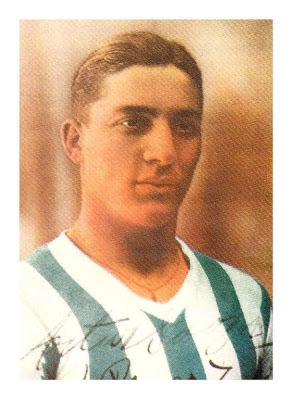 Beginning his career at Club Sport Marítimo, the adept forward and inside-left midfielder extraordinaire would play at Os Verde-Rubros for three seasons, before crossing the Atlantic divide to ply his trade of Northern powerhouse Futebol Clube do Porto for over 16 years. This entry was posted in Legends and tagged 1920s, 1930s, 1931, 1932, 1933, 1934, 1935, 1936, 1937, 1939, 1940, 1940s, 1950s, 1960s, 4123, Acácio, Artur de Sousa, Atlantic, Belem, Belenenses, Benfica, Big Three, Biografia, Biography, Blue, Boot, Campeonato, Cândido, Cândido de Oliveira, Club, Clube, Coluna, Cristiano, Devils, Estádio do Lima, Eusebio, FC, FC Porto, Fernando, Football, Footballer, Futebol, Goals, Golden, Greatest, Joseph Szabo, Legend, Lenda, Liga, Lisboa, Lisbon, Madeira, Madeiran, Maritimo, meio-dia, Mesquita, Mota, Noon, North, Oliveira, Os Verde-Rubros, Osvaldo, Pearl, Peyroteo, Pinga, Portista, Porto, Portugal, Portuguese, Primeira Liga, Profile, Ricardo, Ronaldo, Seleção, Seleção das Quinas, Sport, Sporting, Taça, Three, Three Noon Devils, Torres, Três, Tripeiro, Valdemar, White, Winger on August 16, 2015 by mitchellrua.